Milton Fruit Bowl has been providing their customers with fresh produce for over forty years, so you could say they know what they’re talking about when it’s comes to fruit and vegetables, not to mention plenty of other delicious local goodies. If you can’t get it at the Fruit Bowl, you probably can’t get it at all, which is why they are always our first stop for everything from coconut yoghurt to mangoes. Owners Chris and Charlie have a few tips on what’s fresh and plentiful for October, so you can make the most of it when you stop by to fill up your green bags. 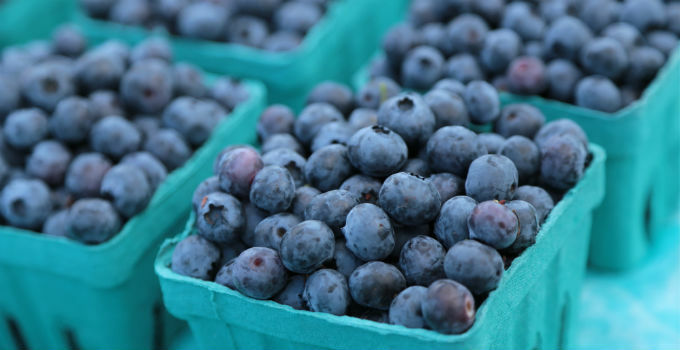 Chris’s Pick: Blueberries What to look for: The bigger and the bluer the better! Best used: Utilized best as a breakfast addition in an acai bowl, or simple oats and fruit salad. Also a fantastic snack for the kids, a punnet in the lunchbox is easy and nutritious! Charlie’s Pick: Asparagus What to look for: Look for firm green stems, not woody ones. Best used: Oven roasted or pan-fried with garlic and Parmesan or feta and thyme. It’s just a good side for everything and a perfect staple for the fridge. Something extra: French picnic baskets Spring is the perfect time to get outdoors and have a picnic utilizing plenty of that seasonal produce in salads and sandwiches. Pick up one of Milton Fruit Bowl’s gorgeous cane picnic baskets when you do your shopping and you’ll definitely be ready for spring.